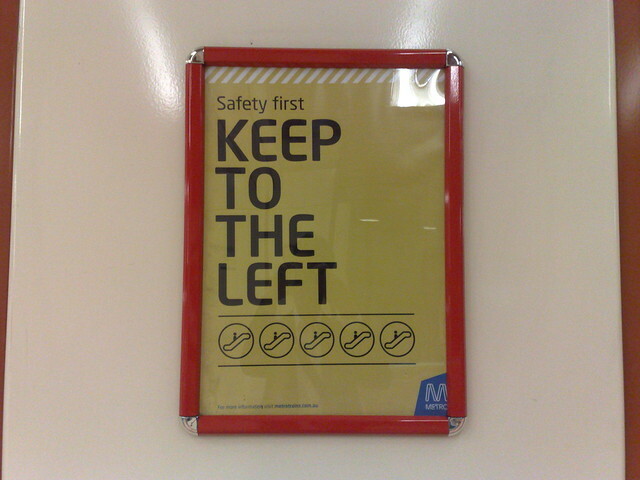 Years ago there were “Stand on left / Walk on right” signs on the escalators at Melbourne’s underground stations. They disappeared about ten years ago. While regulars know the etiquette, newbies and occasional users don’t, which causes frustration for those in a rush, particularly outside peak hours when the escalators (for some reason) run at an excruciatingly slow pace. The next step, hopefully, is signage on the escalators themselves, where they’ll get noticed by the newbies… as well as perhaps something a little clearer in its intent. It’s only a little thing, but it makes a big difference to regular train users. Not before time. It is one of my pet hates. Might not just be an ignorance thing. Here in Taiwan everything is ‘keep to the right’, yet the number of times I still default to the left worries me a bit (escalators, footpaths (even the lane of a road sometimes…). If you’ve lived decades doing the opposite it can be hard to adjust, even if there are signs all around reminding you what to do. These signs have been at Melb Central for a while now too. Hopefully they make a difference! I was under the impression that escalators run slow outside of peak hours to save power (and therefore money). They need these at Box Hill Station. There are just some really ignorant people who like to hold everyone up at the escalators. As well, I’ve noticed recently in general, a lot of people fail to give way to passengers trying to get off the train and push through. Is it really that hard to paint some arrows on the platform? Yay! About time, I say. Another yahoo here about this. I’m actually surprised it took Metro this long. I wrote to Connex when they were “in power” and got a response saying that their policy was for people to stand on escalators and they would not be putting up signs. We can advise that relevant signage relating to escalator etiquette is in place at our stations, where escalators form part of the station precinct. However,as you will appreciate, whilst we take all relevant steps to educate the travelling public on the considerate use of all infrastructure, including our escalators,the onus is on the individual to exercise consideration towards fellow commuters. For legal and safety related reasons, we do not encourage customers to walk on the escalators. Although it is not against the law to do so, customers do so at their own risk. Generally, customers are courteous when using the escalators and do stand to the left, giving way to those who choose to walk up/down the escalator. As you may appreciate, whilst these recommendations are provided we are not in a position to enforce them. As such, we regret that your personal experience,when using the escalators may not have met your expectations. I’ve also heard from someone else who wrote to them years ago that another reason they gave for not having signage is that escalators were not designed to have the unbalanced load of one half walking and the other half standing and it would wear them unevenly. They have the same etiquitte here in Japan (stand on the left, walk on the right)and everyone follows this unspoken rule but all the signs here actually ask people not to walk on the escelators at all due to safety reasons. Still, nobody follows these signs and instead keep to the ‘unspoken’ rule. I agree with jon that the escalators run more slowly outside peak period for power/cost saving. I’ve always thought of this as a good thing. Looking at it from a different point of view, whilst I can appreciate that people are in a hurry, and that other people are inconsiderate and get in their way, it can sometimes be a bit like the drivers that floor it from each intersection, only to wind up stopped with everyone they left behind at the next red light 200m down the road. An escalator ride only takes <30 seconds in most cases. In comparison to the whole of your day, is it really a big thing if you have to stand, and take a few seconds longer than barging through in a pressured hurry? @Nate, if you’re going to draw that analogy, it’s the equivalent of people driving at half the legal speed in the fast lane of a multi-lane road. There’s no need for it. There’s space for people to go fast or slow, as they wish. And I can tell you that I missed a train this afternoon by seconds, due in part to two slow people in front of me on the escalator. Do Metro simply power off one of the three escalators at Spencer St station? Quite often during morning peak times (almost everyday) at least one of them isn’t working, but in the evening peak it’s one of the other two that is switched off. @david, don’t know, but it won’t be Metro – that station is run separately by the Southern Cross Station Authority.